Prior to commencing his doctoral studies in January 2014, Irfan Yusuf practised law in four Australian states with a focus on workplace relations and advocacy. 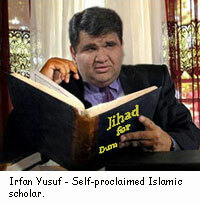 Irfan is also an author. His book Once Were Radicals: My Years As A Teenage Islamo-fascist won the Allen & Unwin Iremonger Award for Public Issues Writing and was published in 2009. The book deals with his flirtation with political and jihadist Islam during the 1980’s in a light-hearted fashion. He has also written a chapter for the anthology Coming of Age: Growing Up Muslim in Australia, published by Allen & Unwin in 2014. Irfan prefers to avoid taking himself too seriously.